HENRY MULL. In every community there are men who by reason of their characters, business ability and effective handling of everything they undertake possess a leadership and influence that help mold the destiny of themselves and their surroundings. Such a man in Clark County is Henry Mull. Mr. Mull is one of the earliest pioneers of that county. He went through the fire of adversity and came out stronger and better off than before. But the important part of his life has not been so much his material accumulations as the part he has played in building up and maintaining good schools, and in an honest and effective advocacy of good roads and every other instrumentality that raises the standards of community living. Clark County has made commendable progress in the building of good roads, and every one competent to speak on the subject gives Mr. Mull a large amount of credit for that feature of public enterprise. The Mull home is in Vesta Township, ten miles west and two miles south of Ashland. Mr. Mull is now living where he preempted a claim in section 29, township 33, range 24 in November, 1884. While he thus secured an opportunity to live in the country he began his residence here on April 4, 1885. He succeeded a previous settler and thereby secured his improvement, consisting of a little dugout. Around that he collected some shanties and had a sort of cluster home until more permanent buildings were erected. Mr. Mull first came to Kansas in 1884, spending about a year in Harper County. His first Kansas crop was raised, however, in Clark County. He brought three teams to the state with him, trading one of them for land in Harper County and bringing the other two and a milch cow to Clark County. Besides the energy of his character another thing that distinguished him somewhat from most of his neighbor pioneers was the possession of a capital of about $2,000, so that he had a safe margin during the uncertainties that prevailed in the early years. Like other early settlers he attempted to farm the land. In the spring of 1885 he planted corn on the sod, and had about ten acres that wielded a hundred bushels to the acre. After this crop he was perhaps justified in feeling that this section of southwestern Kansas was equal to if not superior to his old home state of Missouri as a corn country. But he was disillusioned in 1886, when only his fodder matured and in 1887 there was a total failure of crops. Then his surplus cash came into good play, and enabled him to stay while all his neighbors were breaking up and abandoning the country as rapidly as possible. The years went on, some fair and some poor, until 1893, when with the opening of the Cherokee Strip in Oklahoma all who were not permanently anchored in this region went away and the Mull family were left entirely without neighbors. Mr. Mull declares that this situation presented the big opportunity of his life. His modest fortune came to him because the entire country was thrown open to pasture as it had been twenty years before, and with almost unlimited range he "plunged" in the cattle industry. He borrowed money and invested in cattle, buying up a large amount of stock of Old Mexico, ranging in age from yearlings to critters ten or twelve years old. All the calves under nine months of age were thrown in. He set these cattle to grazing on the pasture range. Their original cost was approximately eight dollars a head. By introducing some registered bulls in the herds he had in a year or so the making of some fine range beef. When at the high tide of this industry Mr. Mull was running about 1,500 head of White Faced cattle. For a pasture he fenced about a half a township, without a single habitation inside of it. The lands surrounding him practically all fell to the mortgage companies as the original settlers went away, and those companies held title until a new tide of settlers came in, except for such as the men like Mr. Mull who elected to remain. Mr. Mull has developed a ranch of between 3,000 and 4,000 acres, all under fence, and about 2,500 acres are being farmed. He has tenants and three sets of improvements to accommodate his force. Mr. Mull is one of the "bonanza" farmers of Southwestern Kansas. For several years he has used tractors and other modern machinery in plowing, planting and harvesting. In 1918 he brought to Clark County the first "combined" machine to take care of his grains, a machine that cuts and threshes in one operation. With these evidences of his material activity something should be said of Mr. Mull's active citizenship. He was one of the organizers of the first school district and became a member of its first board. He has been a school official since he was about twenty-one years old, and can speak with authority on matters pertaining to the public and rural schools. In his district they built a frame schoolhouse, the Cottonwood School, a building that was subsequently moved and is now known as the Fairview School. The Mull neighborhood created a consolidated or union district, building a house a mile west of Mr. Mull's farm. Two teachers are now employed and at times wagons gathered up the children and return them home during the school months. Mr. Mull has served as township treasurer many years, and has given much of his time to the grading and upkeep of the highways and to stimulating highway improvements according to the modern standards. In politics Mr. Mull is a republican. He deviated from his party allegiance to support "Sockless Jerry" Simpson for Congress during the era of populism and in former years he attended various local political conventions. Referring to his family history, Mr. Mull is a native of Missouri and was born in Schuyler County, March 21, 1849. He grew up on a farm, had a common school education, and was with his parents until past the age of twenty-one. His early experience which he brought with him to Kansas was as a farmer and carpenter. His father, Henry Mull, Sr., was born at the village of Woelfers, Braunsfeld, Germany, where his father conducted a large distillery, making whiskey from potatoes. Henry Mull, Sr., came to the United States alone, and was followed by a brother who soon died at old Marion in Missouri. Henry Mull, Sr., settled on the Mississippi River at Old Marion and was a storekeeper there until about 1843. In 1844 his business was swept away by the great flood on the Mississippi River, and he then moved to some of the swamp lands in Schuyler County and spent the rest of his days there, though for two years he lived in California. He died in Schuyler County when about sixty-nine. During the war he was a member of the Home Guard of Militia and his oldest son went through the war in the 21st Missouri Infantry. He was an active man in his community, especially in church affairs. He is buried in the German Lutheran Cemetery of Schuyler County. He married Margaret Knittle. Her father, John Knittle, was born in Germany and was a Missouri pioneer farmer. Mrs. Mull, Sr., survived her husband and died in Harper County, Kansas. Their children were: John, who died in Harper County; Henry; Mrs. Lizzie Hoffman of Arkansas; Mary, who married Charles Derigo and died in Schuyler County; Adam, who lives in Montana; Etta, of California; and Mrs. Henry Hawes. Henry Mull, Jr., married in Schuyler County, Missouri, May 18, 1872, Adaline Dierling. Her father, Philip Dierling, came from Rhenish, Bavaria, and was a Missouri farmer. Mrs. Mull died after the family came to Clark County. Her children were: John, who lives on the Mull ranch and by his marriage to Dora Heap has four daughters and a son. William H., also a ranchman in the home community, married Della Myers and has a son Henry and two daughters. Alvin, at the old ranch, married Ora Klinger. Frank, a resident of Great Bend, Kansas, married Gertrude Canton and has two daughters. Mr. Mull married for his second wife Miss Jennie Warner. Her father, Frederick Warner, also came from Germany and was a Schuyler County, Missouri, settler. 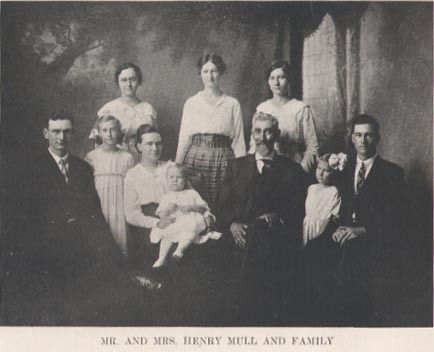 By his second marriage Mr. Mull has the following family: Fred, who married Naomi Park and has two daughters and a son; Sophrona, who lives in Oregon, is the wife of Howard Beidler; George married Mary Hensley and has one son; while the younger children are Pearl, Ruby, Opal, Helen and Louisa. The head of the Mull household, as this record indicates briefly, has lived long, usefully and well. The past is well reflected in his appearance and bearing. He stands erect and vigorous in the face of his approaching age of three score and ten, and is a man of great good nature, friendly and hospitable, and with a vision and sympathy by no means limited to his own immediate interests.